Arena rock favorites Imagine Dragons, who honed their act in Las Vegas, turned the Tacoma Dome into a sea of pumping fists on Friday, July 31. 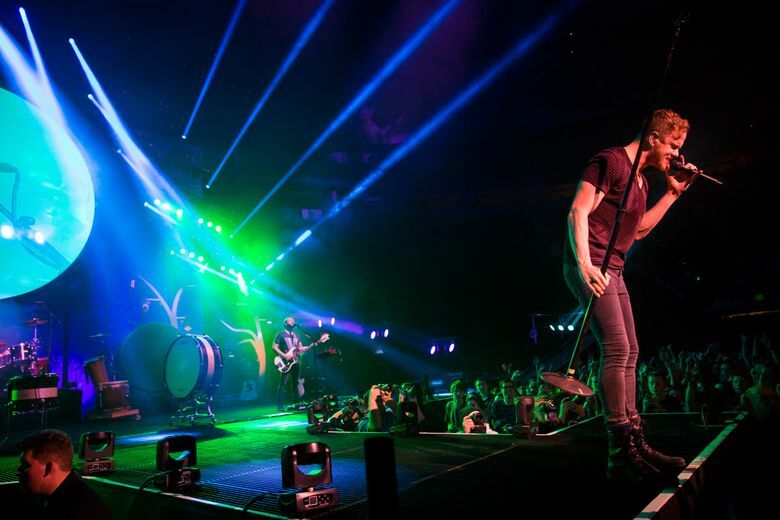 On tour in support of its second album, Las Vegas rock band Imagine Dragons headlined a hard-rocking triple header Friday (July 31) at the Tacoma Dome, with Metric and Halsey. The album’s title is “Smoke + Mirrors,” which appropriately described the band’s special-effects-laden show, packed with lasers, LED lighting, live videos, artificial smoke and a big ramp extending into the crowd. Despite the band’s penchant for arena-rock clichés — guitar and drum solos, overwrought ballads and pedal-to-the-metal anthems — lead singer Dan Reynolds is an earnest, engaging performer who easily connected with the band’s hyper-enthusiastic fans. Reynolds was comfortable talking about his struggle with depression and his hope for America’s future. But above all, he was grateful for his band’s chart-topping success. There was nothing snarky about him. Imagine Dragons learned to be good entertainers playing the Las Vegas Strip, where the energy level had to be high in order to draw a crowd. In Tacoma, fans waved their lighted cellphones during couples-clutching power ballads and broke into hootenanny hand claps when the band rocked and rolled with high-decibel intensity. At times, the main floor was a sea of pumping arms. Concertgoers spanned generations, from kids attending their first concert to middle-aged rockers who discovered the band in Vegas. The band opened with the surefire rocker “Shots,” followed by “Trouble” and “It’s Time,” a thunderous singalong. Reynolds sang falsetto on “I’m So Sorry” and teamed up with guitarist Daniel Wayne Sermon on the romantic ballad “Gold,” adding delicate touches to an otherwise explosive show. Indeed, such high-powered songs as “On Top of the World,” “Radioactive” and the drum-laden “I Bet My Life” were a bit overdone. But fans loved them. The opening acts were a bonus. Led by expressive singer Emily Haines, Canadian indie-rockers Metric performed a spirited set featuring such songs as “The Shade,” “Cascades” and “Too Bad, So Sad,” from the band’s new album, “Pagans in Vegas,” due next month. Sassy, self-confident New Jersey native Halsey played a high-powered pop-rock set featuring “Ghost,” her alluring debut single.